At long last… my Food Wine Rome is ready! 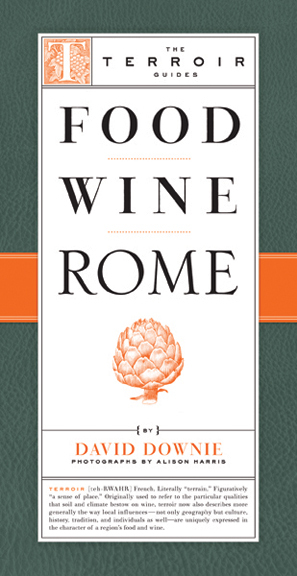 Based on the award-winning, critically acclaimed short history of Rome's foods and wines, with hundreds of restaurants, trattorias, osterias, wine shops and wine bars, delis, bakeries, pastry shops, caffe' and more, this is the guide to end all guides when it comes to the food and wine of the Eternal City. Here's the bumph and a link (or just click on the images). Buon appetito! Food Wine Rome is about eating and drinking the Roman way. The selection of food artisans, specialty food and wine shops, and places to eat and drink, reflects native sensibilities reaching beyond the touristy areas into outlying neighborhoods where the concentration of culinary delights and their degree of authenticity are high. Rome ranks high among Italy’s great food cities. It is a rich capital city and has the means to spend on quality, its gastronomic traditions are ancient, and it has some of the most demanding food consumers in Italy. They won’t buy mediocre ingredients or eat mediocre meals for long. Like New York or Paris, Rome is a talent magnet. Many of the best cooks and products from all over the country are here. But the Eternal City is not immune to global trends. Agribusiness is taking over age-old traditions fundamentally changing the way food is grown and animals are raised. Supermarkets are popular: estimates are over 400 of them are now scattered across town. Globalization is changing the country and its food-ways: fast food and junk food are taking hold, especially among the young. Happily the combined phenomena of factory farming, discount hyper-markets and processed or fast food have not yet killed off Rome’s vibrant, small family-run traditional food and wine specialists, one-of-a-kind retail food shops, cafes, trattorias, hosterias, osterias, pizzerias, and restaurants. The best of the best feature in this app. Increasing numbers of Italians are turning back to their traditions. There are reasons to believe the excellence of the Roman eating experience will continue for a long time. The restaurants, trattorias, osterias, and pizzerias included in this guidebook are tried and true, serve Roman food and could only be found in Rome. Trendy or international-style restaurants and establishments serving food that may be very good and skilfully prepared but has little or nothing to do with Roman tradition are listed by type as Trendy. Rome Specialties: The ice cream (gelato), chocolate, pizza, and pasta — not to mention the coffee and yes, the wine — are outstanding in Rome. So are the fresh fruit and vegetables, thanks to the country’s attachment to the Mediterranean diet. 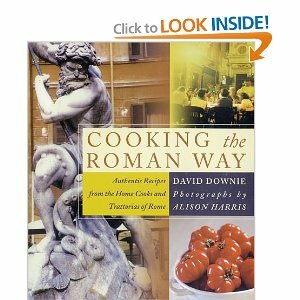 Like the city’s name and history much of Rome’s cooking is familiar. Many classic Italian dishes come from Rome and Lazio or other adjoining central Italian regions near the capital: Campania, Abruzzo, Tuscany, and Umbria. Experts wrangle over where certain dishes were invented and when, but, like it or not, Romans make claims on bruschetta, braised artichokes alla romana, fettuccine Alfredo, penne all’arrabbiata, spaghetti alla carbonara, bucatini all’amatriciana, spaghetti alla puttanesca, stracciatella (egg-drop soup), saltimbocca alla romana, grilled abbacchio (suckling lamb), spit-roasted stuffed porchetta (suckling pig), crostata jam tarts, tartufo chocolate ice cream, tiramisu, zabaglione, and zuppa inglese. The city’s food has also been influenced by Rome’s Jewish heritage. Over the last 2,000 years Roman-Jewish food has developed a distinct character, contributing to the mainstream repertoire: fried artichokes alla giudia, sautéed spinach with pine nuts and raisins, sweet-and-sour salt cod, slow-cooked beef pot roast, and Roman-Jewish ricotta cheesecake among many others. Normal retail business hours are Monday through Saturday 8/8:30am to 12:30/1pm and 3:30/4pm to 7/7:30pm. Few retail businesses stay open during lunchtime. Opening hours for bakeries and fish shops vary widely, sometimes starting early in the morning (6/6:30am). Wine shops and wine bars often open late (10/11am) and close late (8/9pm). Coffee shops (caffè in Italian) open early (7am), and remain open through lunch time, closing at 7/8pm. Romans eat later than many Italians: most restaurants seat guests for lunch from 1/1:30pm to 2:30/3pm; dinner is from 8pm to 10/10:30pm. Many restaurants that serve lunch at noon or 12:30 and dinner at 7pm cater to tourists. Important: closing times and vacation periods. Nine in ten food- and wine-related businesses are closed Sundays and a half day or full day once a week, often Thursday afternoon. Most businesses close for vacation for several weeks or a month, usually in August. Summer hours are often shorter than fall/winter/spring hours. Prices for a three-course meal, per person, without beverages: $ = Inexpensive, under 30 euros; $$ = Moderate, 30 to 40 euros; $$$ Expensive, 40 to 50 euros; $$$$ Very Expensive, over 50 euros. Author, journalist and private tour guide David Downie has written over a dozen nonfiction and fiction books including the critically acclaimed Food Wine Rome, Cooking the Roman Way, Quiet Corners of Rome, Paris to the Pyrenees: A Skeptic Pilgrim Walks the Way of Saint James (April 2013), the bestselling classic Paris, Paris: Journey into the City of Light, and the chilling thriller Paris City of Night. He has contributed articles and stories to many anthologies and over 50 top print magazines and newspapers worldwide, plus many websites and blogs. 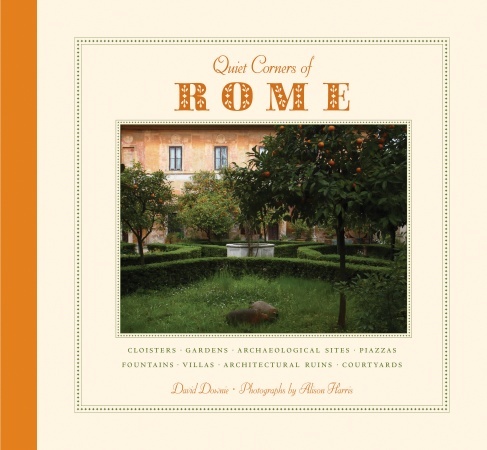 David Downie is a frequent visitor to the Eternal City, often for extended periods. His mother is Roman and he lived in Rome when young. Since 1984 he has divided his time between Italy and France, basing himself in Paris. Downie is married to photographer Alison Harris. Please visit David Downie’s websites at www.davidddownie.com and www.parisparistours.com.